Infuse My Colour Platinum Wash Purple Shampoo New Vegan 250ml. Condition is New. Dispatched with Royal Mail 2nd Class. This is brand new, never been opened and is well regarded as one of the best shampoos for blonde hair. Silicone and paraben free and totally vegan. • correct unpleasant yellowish tint of bleached, natural blond or blond colored hair;. Coloring Shampoo for blond and grey hair With Anti-yellow effect. SILVER SHAMPOO. NEW – SILVER technology – gives hair exclusive silver hue and shine. Paul Mitchell Color Protect Daily Conditioner 500ml - Colorcare Coloured Hair. Condition is New. Dispatched with Other Courier (3 to 5 days). An intense, sulphate free, shampoo specifically formulated for use on super–lightened, grey or bleached hair. Changes hair colour to silver/ash tones. Specifically formulated for use on super-lightened, grey or bleached hair. 400ML EACH. A LUSCIOUS FORMULA WITH MAGNOLIA, SANDALWOOD & STRAWBERRY SCENT. Our formulation, enriched with chestnut natural extract, nourishes your brunette hair for maximum radiance and silkiness. It is suitable for all tones of natural, highlighted or colour treated brunette hair. Marseille Soap. Lavera Colour & Shine Shampoo with Organic Cranberry & Organic Avocado protects colour-treated and highlighted hair and gives a natural radiant shine. This organic shampoo effectively cleans coloured hair without stripping the hair of its natural oils. A lightweight, gentle, conditioning & cleansing shampoo that leaves your color treated hair 3x more fortified. This shampoo contains a cleansing formula that cleans your hair from root to tip, extending the life of your colour whilst also providing a soft, smooth feel all over. L'Oreal Professionel Mythic Oil Colour Glow 100ml. To illuminate the ends of your hair. Suitable for all hair types but especially good for coloured treated hair. Size: 1000ml / 1 litre. Suitable for coloured hair with dark shades. Gently cleanses and neutralises undesired copper/red reflections, leaving hair shiny and hydrated. FANOLAANTI-ORANGE/NO ORANGE SHAMPOO. Repeated washing, sun exposure, pollution and external aggressions can make coloured hair more sensitive. The science of coloured hair. 2 Protects Hair: The formula enriched with UVA/UVB Filters protects coloured hair from external aggressions. KLORANE CAMOMILE SHAMPOO 200ML. KLORANE Conditioner with Chamomile 200ml. Give your blonde hair a golden shine with this Camomile Shampoo For Blonde Hair. With concentrated camomile, that has been used to naturally lighten hair for many years, this shampoo works both nourishing and illuminating. While Moroccan rose nectar surround you with a bright, uplifting scent. For better results use with Herbal Essences Ignite My Colour Shampoo. Enjoy Moroccan Roses essences. Radiant shine of your coloured hair. No Orange Shampoo is suitable for coloured hair with orange tinges and dark shades. Anti-Orange Shampoo for Coloured Hair with dark tones. Mild shampoo. This shampoo is best used as a pre-toner in the basin before applying toner. Serioxyl by L Oreal Professionnel Clarifying Shampoo 250ml for Thinning Hair . Radiant shine and vibrancy for coloured hair. With Colour Revitaliser. Shampoo 250ml Conditioner 200ml. If you’re wondering how to make hair color vibrancy last longer, the secret is using products that will nourish your colored hair. Simply apply Dove Color Care Shampoo to wet hair, lather and rinse. This shampoo gets rid of unwanted yellow, brassy tones and also reflections after bleaching. 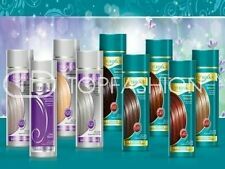 Hair is left streak free, smooth and with a satin finish. To use: Apply to wet hair, massage gently and rinse.Fanola No Yellow Shampoo. 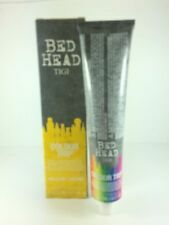 Tigi Bed Head colour goddess shampoo and conditioner tween duo set for racy red heads and bodacious brunettes. With the delicious fragrance of toffee heaven this Tigi shampoo battles hair fading and dulling as well as preventing hair dryness. Its Nourishing Linseed Oil and UV Filter Content Repairs and Vitalises theColour Treated Hair. COLOR Hair Mask for Colour Treated Hair Mask Recovery 1000ml. Natural eco shampoo for hair - revitalizing color. Orchid extract smoothes out hair, restoring natural glow and silky to them. Organic jojoba oil promotes the strengthening of the hair structure, protecting it from color loss. 3 x Garnier Olia After-Colour Care Hair Conditioner 54 ml Size New and unopened. & John Frieda Brilliant Brunette Visibly Deeper Conditioner 250ml. full size products. MATRIX BIOLAGE DELICATE CARE MASQUE 150ml- For colored hair.